I have this one and I'm very happy with it. It doesn't automatically open with the door though. Don't know if that's a deal breaker for you or not. I was looking at that one, I couldn't work out if they had lids or not? In other words, is it just one action to be able to throw the rubbish in? No, you have to open the door to then pull open the bin. If you look closely you will notice there is a handle close to the top of the bin. Did you look at the links I put up???? 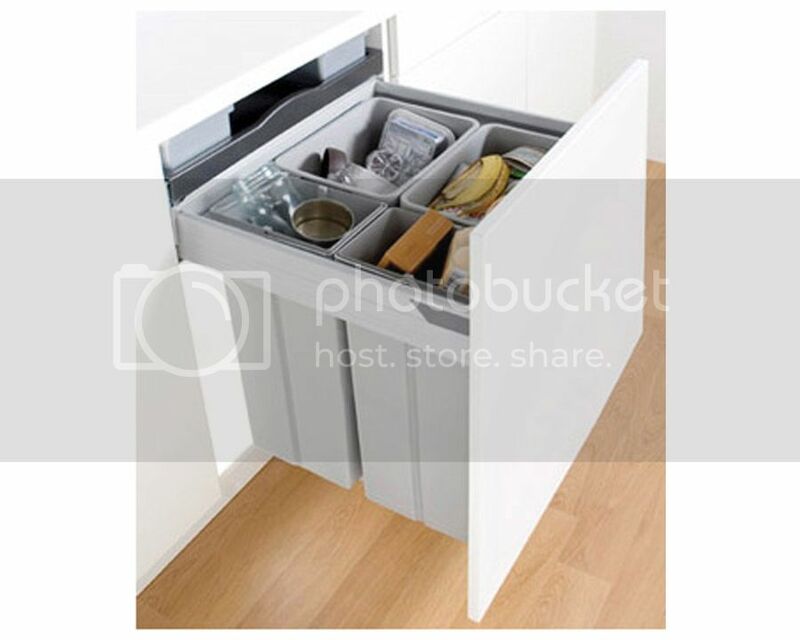 This bin fits into a 300mm cabinet and the door fits onto the bin. So the bin opens when you pull the door open. You have to slide it out after you open the cupboard door. It doesn't have a lid. We have ours in a narrow cupboard that doesn't have anything else in it ie. It's just for the bin. I have decided to minimise the bin (yes, more trips outside), and use the room for something else. For the lid part you can fit a full depth shelf above the bins to act as lid ans you can still use the shelf for things like dust pans and garbage bin bags. They look good but do those ones have a lid? You need a A Blum Tandembox Drawer for them to work. The Hafele ones you were originally going to get look like you have to open the cupboard then the bin, which would be a nuisance. Yes they come with a lid. By all means go for something like in your photo but be aware that the Pull Boy bin is like a BMW M5 and that bin in your picture is like a Kia Rio! The runners for the bin I am suggesting hold 65kgs and come with a lifetime warranty and are the new softclose technology. They also work with the servo drive mechanism. The runners in the Kimberly bin have been around for 20years and belong in a museum. There really is no comparison between what I have suggested in those. Yes they are cheaper but they wont last as long or work any where near aswell! Your ones must be really super excellent then to justify the higher price, as the ones I have seen in a friend's kitchen come out incredibly smoothly! Actually you can probably tell me the difference between these .. The Kimberley bins use this mechanism, soft closing ball race runners. They are also used by Hettich. How do these actually work compared to the Blum soft close? Do they have servo drive (opens it self with a slight touch) do they have softclose and do they have a lifetime guarantee on the runners? Yes they are that good. I have fitted the bins your talking about and its like comparing prison food to a 3 hatted restaurant! I'm getting tempted! But they really don't look like they have a lid .. 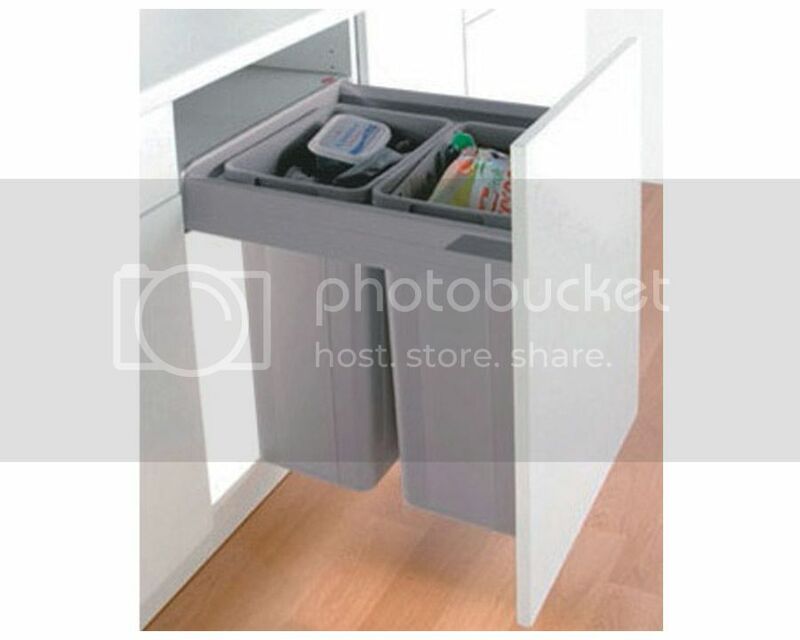 I want ones that slide out when you pull the 'drawer' ie cupboard out, ie door mounted, but with lids that stay inside and you don't have to open the lids separately.